Sunset Boulevard. Located in the heart of Pratumnak, this building is brand new. In a quiet soi, you can appreciate the benefits of this desired location. Within minutes walk there's a myriad of local shops, restaurants for all palates, bars and the famous Cosy Beach. There is easy access to both Pattaya and Jomtien. The unit is 35m², more than adequate for the full furniture package in there including a European kitchen, large bed, table and chairs, built-in mirrored wardrobe and balcony furniture. The balcony overlooks a water feature. 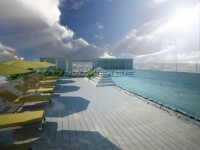 The building has a great swimming pool, a fitness centre, secure underground parking, and 24-hour security. Available for rent on a long term basis at 18,000 Baht, or for sale in Company Name with possible finance deal.